This is the first time I’ve created broth using a pressure cooker. Not going to lie, I’ve always found them a bit scary and avoided using mine. My pressure cooker has sat on a dusty shelf for long enough and I decided it was time to get over my fear. And it makes life so much easier and saves so much time, especially for something like oxtail, which needs cooking for a long time. If you don’t have a pressure cooker, you will need to cook the broth for about 4 hours. Oxtail has a lovely deep flavour and makes a rich soup, plus the meat can be shredded to top the ramen. I added several different types of chilli to heat up this ramen, as this time of year is dreary and wet (we’ve even had two lots of heavy snow recently- quite rare in Sussex! ), there is nothing quite like the warming heat of chilli. I had a bottle of green ginger wine in the house, so instead of using Shaosing rice wine in the broth, I used this, which gives the broth a really nice sweetness. Preheat the oven to 180˚c. Slice the onion in half and place it and the unpeeled ginger on a baking tray. Cook for 20 minutes, until soft and aromatic. Allow to cool a little and peel both. Heat 1 tbsp sunflower oil in the pressure cooker, add the sliced chilli and fry for a minute. Then add the oxtail and brown on all sides. Add the onion, ginger, chilli bean paste, green ginger wine, Sichuan pepper, paprika and dried chilli to the pan with a litre of cold water. Put the lid on, bring to the boil and pressure cook for 45 minutes. Remove from the heat, allow the pressure to release before opening the lid and remove the oxtail. Carefully shred the meat from the bones, discarding any fatty bits. Keep the meat warm while you prepare everything else. Using a slotted spoon or spider utensil, remove any bits from the broth. Then add the grated garlic, soy sauce and mirin and cook together for about ten minutes. Bring a pan of water to the boil and add the bamboo shoots. Lower the heat and allow to warm through. Drain and keep warm. Bring more water to the boil and add the spinach, cooking until wilted. Drain, squeezing out the excess water. Add 1 tsp oil to the same pan and stir fry the spinach for 2-3 minutes. Season with a little salt and black pepper. Cook the noodles as per pack instructions, drain and divide between two bowls. 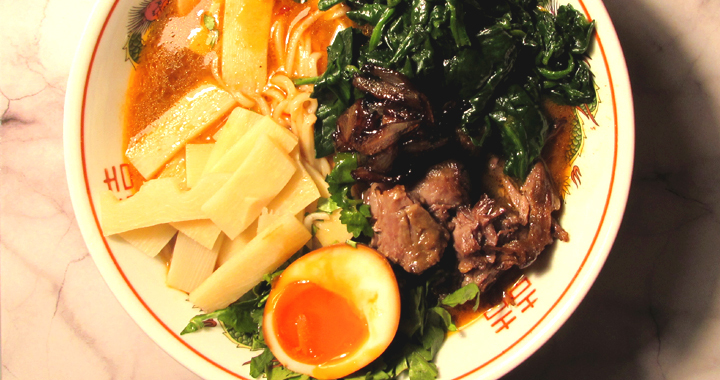 Ladle over the oxtail broth and add half an egg, the oxtail, spinach, bamboo shoots and fresh coriander. Posted in Ramen Dishes, Recipes and tagged Chilli, Oxtail, Ramen, Sichuan.